L. Parziale, D.T. Brit, C. Davis, J. Forrester, W. Liu, C. Matthews, N. Rosselot, TCP/IP Tutorial and Technical Overview Eight Edition // IBM, USA, 2006. J. Doyle, “Routing TCP/IP Volume I”, Cisco Press, USA, 1998, pp.9- 357. M. G. Naugle, Illustrated TCP/IP, John Wiley & Sons, USA, 1998, pp.62-64. K. Mishra and A. Sahoo, S-OSPF: A Traffic Engineering Solution for OSPF based Best Effort Networks, IEEE GLOBECOM 2007 proceedings, 2007, pp.1845–1849. C. Hattingh and T. Szigeti, End-to-End QoS Network Design: Quality of Service in LANs, WANs, and VPNs, CiscoPress, USA, 2004, pp.44. M. Tanvir, A. M. Said, Decreasing packet loss for QoS sensitive IP traffic in DiffServ enabled network using MPLS-TE, Information Technology (ITSim), 2010 International Symposium 15-17 June 2010, Vol.2, pp.789-793. T. Barabas, D. Ionescu, S. Veres, PIM-SSM within DiffServ-aware MPLS traffic engineering, 6th IEEE International Symposium on Applied Computational Intelligence and Informatics, Timişoara, Romania, May 19–21, 2011, pp.263–268. D. Awduche, MPLS and traffic engineering in IP networks, IEEE Communications Magazine, No.12 (37). 1999, pp.42–47. D. Awduche, J. Malcolm, J. Agogbua, M. O'Dell, J. McManus, Requirements for Traffic Engineering Over MPLS, RFC 2702, 1999. R. Braden, Ed., L. Zhang, S. Berson, et al., Resource ReSerVation Protocol (RSVP), RFC 2205 ,Version 1, 1997. L.D. Ghein, MPLS fundamentals: forwarding labeled packets, Cisco Press, USA, 2007. N. Akçam, M. Ogul, Optimizing Data Transport by Using MPLS-TE- FRR and QoS., International Journal on Communications Antenna and Propagation ,Vol. 2, N. 5, October 2012, pp.283-289. Liotine, M., “Mission-critical network planning”, Artech House Inc., USA, 100, 2003. ISNAD Ogul, M. , Akcam, N. , Erkan, N. . "Measurement of OSPF-MPLS-TE-FRR Line Transitions and Data Losses". 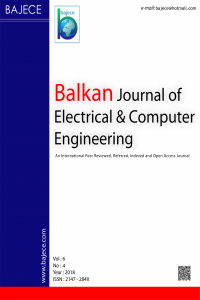 Balkan Journal of Electrical and Computer Engineering 2 / 2 (June 2014): 46-50.